making but I guess we can not post videos. I do not think this is something that would go bad on a train just sitting in a box. You're dead right, and I would say that the seller has misled you (that's the polite version). I would say that there's a problem in the gearbox, and these are not designed for simple replacement of the odd part. 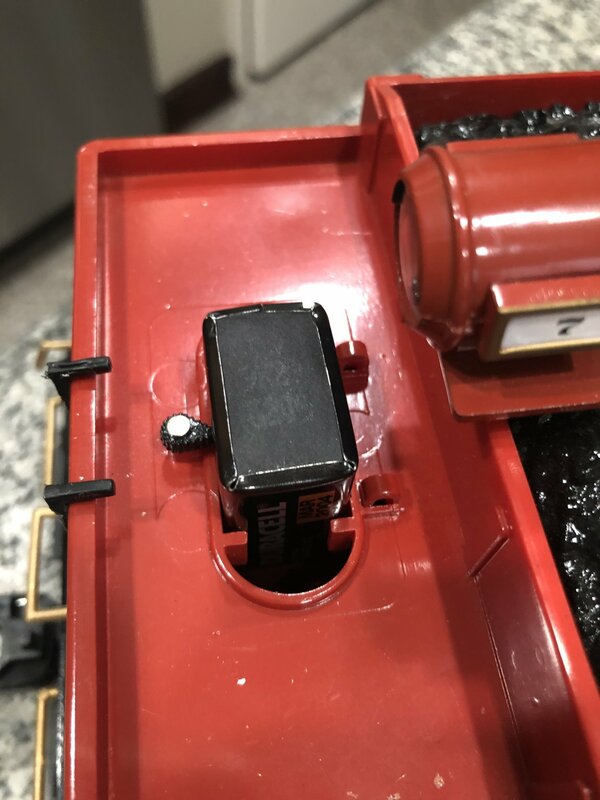 If you feel confident enough to open up the loco from underneath, you may be able to get some parts from the Bachmann estore (not sure what they have available just now). The Bachmann 10-wheeler has been released in about 5 different iterations, and the mechanics have been changed with most of those variations. Definitely a case for ebay resolution I would have thought. Thank you. I am not comfortable taking the train apart at least until I have a response from EBAY. LOL I would not want to return it (if that is the resolution) in pieces I could not get back together. LOL. Agreed, however if you really want to fix it a replacement chassis from Bachmann may be the way to go. They are remarkably good value at the moment, but transatlantic shipping, vat and fees will probably more than double the price! 4-6-0 Standard-Shells & Chassis : Bachmann Trains Online Store! update: My money was refunded in full and she does not want the train back. So how much is a new chassis? I really wanted the set for the caboose, and the Texaco Oil Tanker. I use to have a Texaco distributorship in Portland, Oregon so it seems fun to have. I would like the engine to work though as everything is in excellent condition. Should I just go to the Bachmann website to look for the chassis? I am totally clueless about this if you have not noticed LOL. 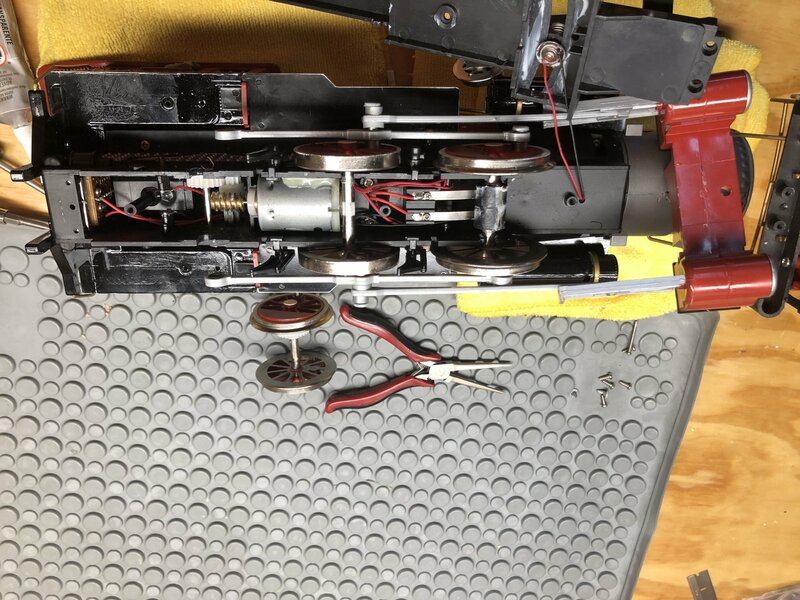 There will be quite a few wires going in various directions - again, all of the diagrams are available on the Bachmann estore website. I can't see that they have a cover hatch for the battery compartment, though. By the way, the Bachmann gear that is cracked and slipping on it's shaft CAN indeed go bad just sitting. The common wisdom attributes these failures to the plastic shrinking over time. At some point it shrinks so much that it cracks and now is not well connected to the shaft and it just spins and makes noise as opposed to transmitting power to the wheels. So, this can happen, and it can happen at any time. Only the latest chassis have overcome this, and I believe there is still one "nylon" gear in the drivetrain. Probably so, but I'm not able to answer for the 4-6-0 as I haven't had a failure there. but as the inside shrinks, the metal shaft does not and the gear cracks because it cannot compress the metal shaft. There is also some conjecture on the dimensions of the cast gear and the shaft, but it's really the cheap plastic. This is well documented in their locos. I'm hoping to hold out a while longer too ha ha! 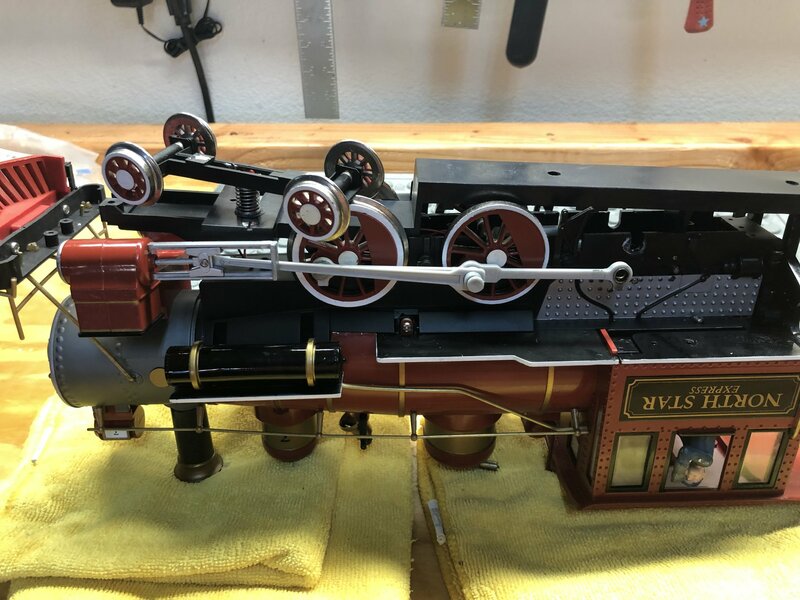 The chassis in the Bachmann store come in 2 varieties: the "anniversary" engines, with metal rods between the wheels, and the "regular" version with plastic side/coupling rods. 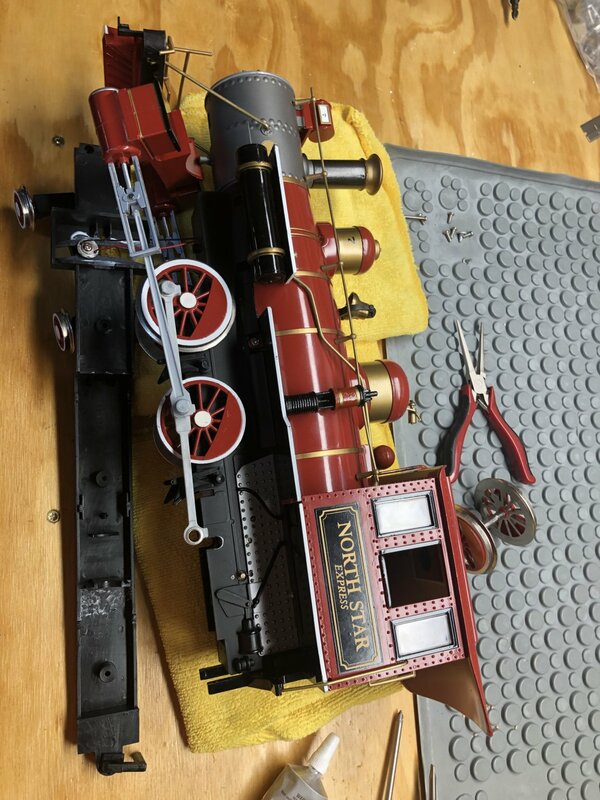 I'd tell you the 'regilar' will work fine, but I recall there was a Xmas set with an Anniversary engine that was called North Star or something. So check your rod type (or post a photo of the side of the engine and we'll tell you what it is!) Then order the appropriate chassis. They are pretty easy to swap, and copious instructions are online. Just google "swap bachmann big hauler chassis" and you'll get lots of reading and viewing material. All of you, or just certain bits....? I have just decided it is not worth putting any money into. The plastic gears are not crack anywhere that I can see. I have three other LGB engines I can use so why put money into a less superior engine that I I really do not need. I really wanted the set for the caboose and the Texaco tanker so I am happy. Well, if you've got the bits you want from the set and feel that it doesn't owe you anything, then that's a result! Just a suggestion - take the non-running loco and paint it up in very heavy rust and weathering (all good practice!) then park it on a siding somewhere on your layout as a "retired" loco waiting to be scrapped.....? That is a very cute Idea! Thanks ! Well I took the engine apart yesterday again. I still did not see anything wrong. Then hubby came home and immediately pointed out the the lover plastic gear is totally worn out and the gear cogs go not even touch the gear above it. So.....I feel better about keeping the train set. They knew the gears were worn out. What I thought was plastic snow was actually the gear material. I may consider after all getting the replacement chassis after Christmas and after I get over the $800. car repair bill for my daughter's car after her ex boyfriend put water in her gas tank. sigh. Fred2179G can you link me to the site for the chassis? I need to send a picture of the side of the loco I guess so you said you could identify which one. I hope these are the pictures you need.